When a couple finds out that they are pregnant, it is something that will change their lives from that point forward. It seems as if everything circulates around that special event and it really should! After all, they are about to embark on a project that will last for many, many years. It is certainly not something that should be taken lightly. If there is one thing that most young couples feel when they are having a child, it is excitement. It seems as if everything is new and that is even true before the baby arrives. They want to prepare everything in advance about the home, their automobile and everything that is going to touch the life of that precious newborn. There is also one special event that they may hold and when you are invited to it, it truly is a treat. I’m talking about the baby shower, a timeless tradition that many women appreciate when it comes to having a child. During the baby shower, friends and family are given the opportunity to provide a gift that may either be monetary or perhaps something that is picked off of the registry. If you are somebody that shops from the registry, you then have a choice to make. You can either wrap things up as is or you can turn them into something wonderful. That is what you are about to see in this unique video. 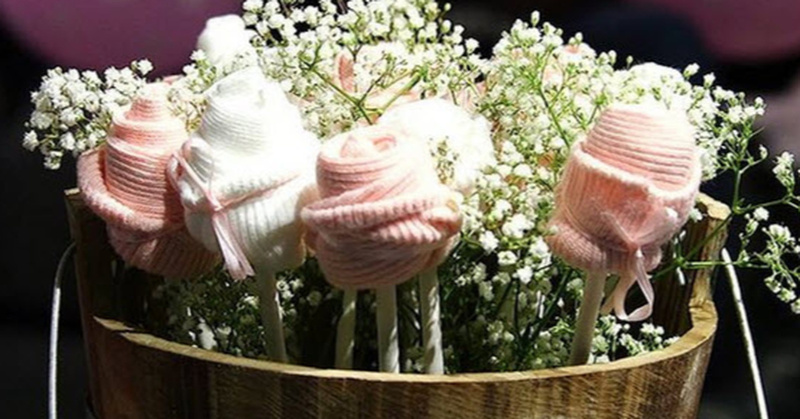 It is for baby socks and when you are finished, you will have created a wonderful and beautiful bouquet. There is nothing wrong with giving an ordinary gift at the baby shower. Rather than having something ordinary, make it extraordinary with this beautiful and unique gift. It will be treasured by the recipient for years to come. Start by folding the sock in half lengthwise. Then, starting at the bottom of the sock roll it up leaving about an inch at the open ended top. Pull the ends around the sock roll to make your rose. Use your pop stick to stick it in the center of the roll. Tie a thin ribbon around the sock to secure it. Put your floral foam in the bottom of the bucket or basket and stick the pop sticks with the roses on them into it. Fill in some of the blank space with Baby’s Breath by sticking it into the foam as well. Not only does this make a cute gift, it is also beautiful as a centerpiece if you are hosting the baby shower!